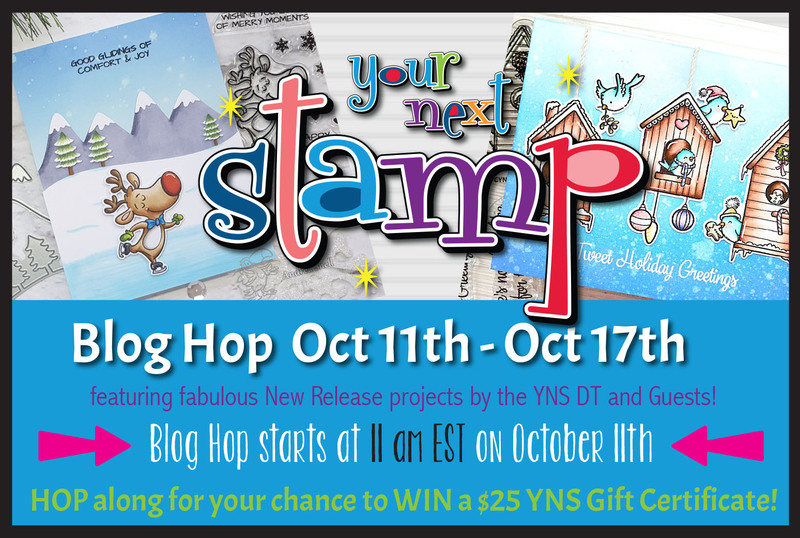 Hollybeary Creations : Your Next Stamp Oct. Release Blog Hop!! 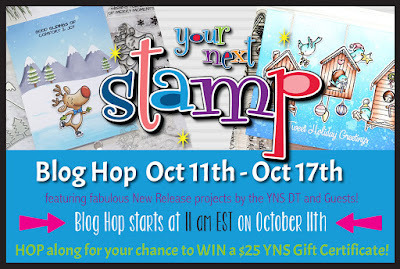 Your Next Stamp Oct. Release Blog Hop!! It's time for the October Release Blog Hop from Your Next Stamp... Hop along with us as we share the New Release which is also available now in the Store. For my first card, I'm sharing the Fleece Navidad stamp set and its coordinating die. I'm also using the new standalone edge dies, Snowy Mountains and Winter Trees. This month's new paper pad is Mint Cocoa Kisses and it's full of Soft Pinks and Greens. 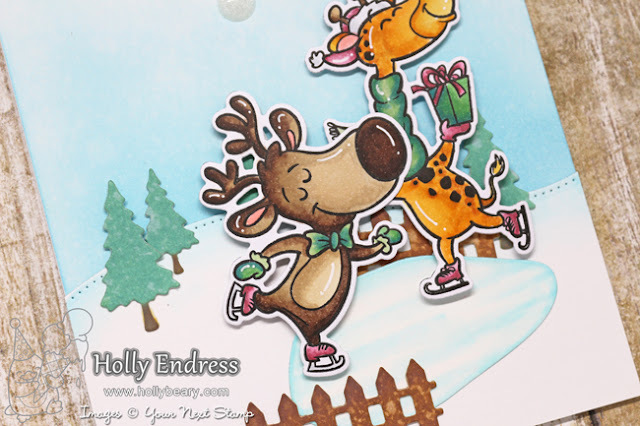 I created a scene with the new dies and some Distress inks and then I added the stamped image. I used the Stitched Rectangle die set to die cut the papers and offset them in the background. I stamped the sentiment on a strip of White cardstock in Stone Grey ink. For an extra Pop of color, I added some of the new Bling It On Gumdrops. Up next I'm sharing the Good Glidings stamp set and Skating Rink Scene Die and Hills with Piercing mark Dies. These are great new standalone dies for creating scenes. I created the scene with the dies and some Distress Oxides Inks. One the water I added some shading with Copic markers and along the edge of the hillside. I stamped the images onto some X-Press It blending cardstock with Black Olive Ink and then I colored them in with Copics. I used the coordinating dies to cut them out and adhered them to my scene with foam tape. I added some of the new Bling It On Gumdrops as well for a pop of sparkle. Are you ready to get Hopping? Be sure to leave comments along the way for a chance to Win a $25 Gift Certificate to the store! I like both cards, but fave is with the happy and in-the-moment gliders. That ice you've colored... sweet. It appears real. So much cuteness. Love the skating critters and the little sheep with the black face. Adorable!!! Great cards!!!! I love your "Gliding By" card. I LOVE how you colored these critters! Such cute little scenes! Great holiday cards, a fun new release! So great! I really love how you used the new goodies! Thank you for the awesome inspiration! OK ok! I definitely need that paper pack! Wonderful creations!! :) So adorable! Your skating critters are so cute. Thanks for sharing your talents with us. Love the "Gliding By"card, it's to cute. Love your fabulous cards. That skating giraffe is soooo cute. Love all the panels on your first card and your coloring on the 2nd one is awesome, as always. Fantastic cards and the skating rink scene is my favorite! darling cards - love how you used the PP! Sooooo adorable!! What fabulous cards and a fabulous release! Loving all the cuteness this release. These stamps and your cards that you created with them are so wonderful! Love them! The skaters are so cute. I love how you colored them, too. Adorable scenes. I like your coloring and the plaid paper. Super cute cards! Love all these adorable critters! I am fan of your coloring ! So perfect ! And i adore your cards ! 2 great cards Holly! Fun scenes and wonderfully colored. Holly, I love your skating animals!! They are so cute!! Your designs are very creative and the colors are spot on!! Great job!! These are adorable!! Love your sweet little, black face sheep; so cute! Fantastic cards! I love your scene and all the paper layering on the first card is fabulous! Love the peaceful serenity of your first card and on your second card, the giraffe and deer and deer make me laugh! They are soooo adorable and funny! You've created 2 wonderful scenes with the new stamps and dies! LOVE them all! AWEsome cards..love the cute images on your fabulous backgrounds..gorgeous colours too.